Giggle gas - something to put a smile on your face. "Giggle Gas - Nitrous Oxide (N20) the power button!" 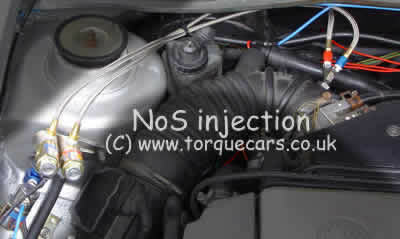 NB: NoS is a brand name of a company but many confuse this with the name of the gas Dinitrous Monoxide AKA – Nitrous Oxide N20, Dinitrous Monoxide, Dinitrogen oxide also referred to as Nitrous or giggle gas (from its medical usage as an anaesthetic. becomes an oxidiser releasing more oxygen into the engine. ranging from 20bhp more to over 200bhp more. full balancing are required if you go for a major power increase. vary depending on temperature. Adding Nitrous is a very easy high power modification. The refills can be a hidden cost though. don’t buy diesels – well not until recently. Nitrous in a car but not vice versa!!! speed as a loss of traction usually equals an impressive spin and crash. few times to clear the cylinders. » Mo Farah's path to Olympic glory - "I just eat, sleep and train"
» Squeeze, Giggle and Abseil!